Good sleep is an important part of feeling rested and being able to pay attention when driving. People who have sleep disorders such as obstructive sleep apnea are two to seven times more likely to have a fatigue related crash. However, people do not have to have a sleep disorder are also at risk of accidents when driving with sleep problems. It is just not getting enough sleep or driving at times when you would normally be asleep also increase your risk of having an accident. How risky is it to drive if I haven’t slept? Research from Australia published in Nature showed that if people have been awake between 21 and 24 hours their performance is the equivalent of a blood alcohol concentration of 0.08%. This means that if you are driving home after a late night out between 4:00 – 7:00 in the morning when you would usually be sleeping, your performance and reaction times are as if you are over the legal blood alcohol concentration. If you have already had a couple of drinks then the effects of sleep deprivation are even greater. It is now well understood in the community that driving when sleep deprived increases the risk of accidents. As a consequence, recently in Victoria, people have been found guilty of driving carelessly and given prison sentences when causing accidents because they have fallen asleep at the wheel after not getting adequate amounts of sleep overnight. The risk of having an accident when driving is even greater when people drive at a time when they would normally be sleeping. This occurs because the circadian rhythm is in a phase where people are feeling much less alert so the risk of falling asleep is greater. What about driving if I have a sleep disorder? People with obstructive sleep apnea are at increased risk of motor vehicle accidents. Various studies show the risk is anywhere between two and seven times the risk. This is a particularly significant risk for people in fatigue critical industries such as transport drivers, pilots or train drivers. These industries are highly regulated, with some jurisdictions requiring mandatory testing for obstructive sleep apnoea if people are at high risk such as having a BMI over 35 kg/m2. However, not everyone with obstructive sleep apnea has sleepiness so people do need to be individually assessed. Some people have only relatively mild sleep apnea but be significantly affected, feeling sleepy in a range of situations including driving. Whereas others can have severe sleep apnea but not appear to be significantly affected. What are my responsibilities as a driver? The responsibilities as a driver vary from state to state within Australia. In most states, it is the driver’s responsibility to notify the licencing authority if they have a condition that will impact on their ability to safely drive. This is the case in Victoria, where if as a driver, you are diagnosed with any condition that may have an impact on your ability to safely drive such as obstructive sleep apnoea, you are required to notify the licencing authority. This will generally trigger a request for a report either from your general practitioner or from a sleep specialist. For more information on medical conditions and driving in Victoria follow this link. In addition to notifying the licensing authority if you have a medical condition that may affect your ability to drive, it’s also worth informing your insurer. If you do happen to fall asleep whilst driving but have not notified the licencing authority or your insurer, they may refuse to provide coverage. 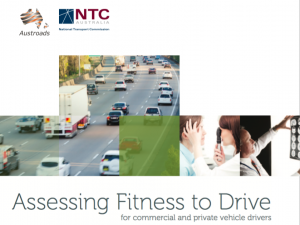 What are the criteria for assessing fitness to drive? In Australia there are standardised criteria that need to be met for assessing fitness to drive. These have just been updated on 1 October 2016, and are available here. Sleep apnea – If someone has sleep apnea syndrome – that is sleep apnea and excessive sleepiness, they are considered unfit to drive until they have been started on treatment and that treatment is effective. For commercial drivers, licensing authorities would usually require documentation of treatment compliance – such as downloaded data from a CPAP machine – as well as objective evidence of that sleepiness is controlled with a test such as a maintenance of wakefulness test. Narcolepsy – People with narcolepsy are not able to drive until they are stable on treatment and also need to have cataplexy controlled. The criteria for commercial drivers are more stringent, and generally people with any cataplexy are not fit hold a commercial or heavy vehicle licence. Need more information about how you can sleep better? At Sleephub we understand the struggle people endure with sleeping problems which is why we have created a comprehensive FAQs page with information for those seeking information about sleep disorders and potential solutions. Check our resources or take our Sleep Wellness Quiz for a free assessment of elements that may be keeping you from a good night’s sleep. Dr. David Cunnington is a specialist sleep physician delivering quality healthcare to clients with complex sleep problems and promoting sleep health through education, research and advocacy. David is the co-director of Melbourne Sleep Disorders Centre, a multi-disciplinary sleep clinic for the diagnosis and treatment of sleep disorders. Is melatonin helpful for sleep?